Well, it was only two hours Andrey, but the fact that we got to the top is a positive. We all know what happened last week so it was vital that we take all three points and go top of the league, even for a few hours. Being two up at half time and then conceding (even though we know there was a offside there) was quite concerning but the team showed some character to keep going and not let what happened seven days ago affect them. It was still a bit too easy for Villa to score for my liking, however, after the week we had, a win is what was needed and we got it. 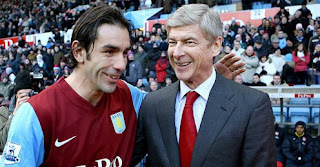 It was nice to see Mr Bobby Pires too, I love the way he gave most of the players a hug in the tunnel then went to Mr Wenger for a handshake, he showed real respect for our club and I hope he has a good season because after what he has gone through, he deserves it. Now the focus turns to what seems like quite a big game at home to Wigan in the Carling Cup (who would have thought that a few years ago). The Carling Cup has certainly changed in regards to the way we look at it. As people say, one trophy and more can follow. A trip to Wembley will give our players some added confidence and it would be nice to make Wembley our second home this season with all three major Cup finals there. Not sure about anyone else, but I am quite looking forward to the Carling Cup game on Tuesday night. Tickets are well priced and availability was there for ALL Arsenal fans. Tickets were on general sale and were priced at £10 and £20 so their can be no complaints there (considering how much they usually are). There has been a lot said about the atmosphere but I reckon there might be quiet a decent atmosphere on Tuesday night. If you’re down there, do make some noise! I know I will! Once again, the away fans were superb yet again at Villa Park and on a personal level, I can’t wait to go to Old Trafford in a few weeks because along with the atmosphere and the way we have been playing away from home, I really fancy it! But for now, its all about Wigan on Tuesday then off course Fulham on Saturday, a chance to sort our home form out so to speak. Sorry for the lack of posts, Saturday certainly took it out of me. With all the hype around the game, it certainly did hurt. I know every fan would have been feeling the same! Roll on Braga tonight, lets just get through to the next round then get a win at Villa park. Hope any fans traveling up there get back safely with all the issues out there. Good luck to them all. All day (in-between work off course) I have been intrigued in the on going debate about the differences between a fan and a supporter. 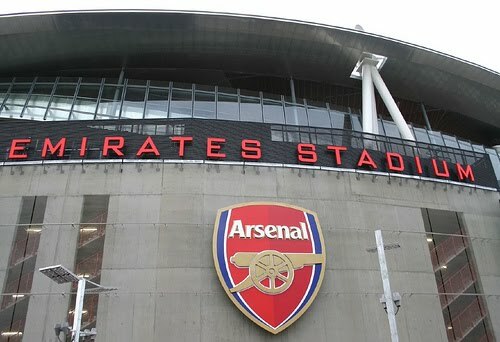 I will not go into analysing the game or provide a match report because others are far more qualified to provide one; however, I do want to dig into the issue of fans and supporters and also the general atmosphere at the Emirates Stadium. Being present at every single home game this season and most home games for several years, the atmosphere is something that comes into question quite often by other fans and now has even become a talking point with our own fans. 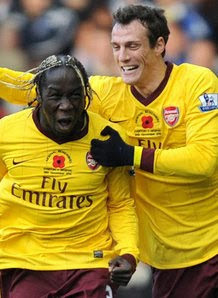 The game on Sunday against Newcastle was a bad one if you’re a follower of Arsenal football club. The week in general was a poor one. Funny how one week we win at the City of Manchester stadium and at St James’s Park then the next week we lose back to back against Shakhtar and at home to Newcastle. The atmosphere was shocking on Sunday against Newcastle, their was no noise, chants were not lasting very long and at times it was even a struggle to hear two claps in a row! People that were not there may think I am exaggerating but I assure you, I am not! Me being me, I tried to start some chants up and the lad next to me always joined in but apart from him and my mate who came to the game with me, no one else seemed interested! It was a struggle to even clap to chants for some people! Yesterday, I heard many reasons on why the atmosphere is so bad and suggestions on how the atmosphere can be improved. Some say because of the increase in ticket prices since the move from Highbury, it has meant some of the working class followers are priced out of the market and been replaced with either the upper class (who some have said rather do crosswords then watch games) or new comers who are so used to success that when it does not come, they get frustrated. Suggestions wise, I have heard that the club level should be removed in the north bank and clock end, season ticket holders who sing should be separated covering each block and to remove the sales of pies and hot dogs so people are forced to sing rather then eat! Some have also called for some sort of an anthem for the club, where people can really get involved and sing up, like at Anfield when ‘you’ll never walk alone’ is played and sung. Even in the away section, I have shivering when listening to the Kop sign their anthem when I was visiting Anfield. Some of the suggestions could work. Some suggestions were light hearted (like the pies and hot dogs) but some were deadly serious. To re-arrange the stadium would prove very difficult as the club level is quite established with season ticket holders and moving normal season ticket holders would be hard because each block has a different price etc. I did think the price factor in general was important. Being someone who goes to every home game and quite a few away games, it sometimes is a struggle. With the Emirates, many new comers have come to watch games live and getting chants together are getting harder and harder. The prices I paid at Highbury were much less then the prices I am paying at the Emirates. I do feel sorry for kids between the ages of 16-21 because football is an expensive business. When you’re young, you get concessions but once you are over 16 years of age, prices increase and for students, it is very difficult to attend many games. So that is a reason for the lack of atmosphere because the same crowd do not always attend games and even though the stadium is always sold out, the crowd varies so people cannot learn songs as they do not go often enough. I understand that some people may just be to shy to sing up or some may not know the words but the least they can do is clap along, there has been times at games, where I have started a song with a mate and people have stared at us like we are speaking a different language. Sometimes, if people do not get to away games, they may not have heard some of the songs but chants like ‘Arsenal’ ‘Arsenal’ ‘Arsenal, when a corner is awarded is not even being sung anymore. My dream is to run and manage a fans group where every member has to take a test, which includes singing a song (the na na na na na Sammy Nasri song would do!) 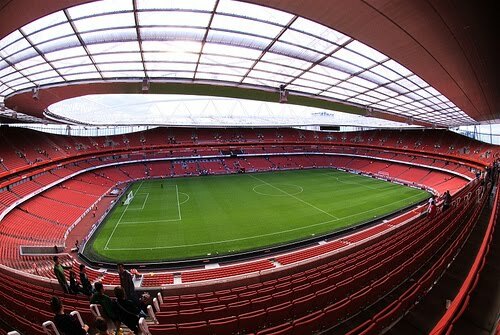 It would be nothing major but would be for people that CARE about the club, I would want young people with fresh ideas, I would want the older generation that have the knowledge and experiences from watching the Arsenal for years and also have the middle aged people who have seen a lot but want to do something extra to help the club; but for now, that’s just a dream!! The fan and supporter thing did make me think. For me, a fan is someone who likes the club but a supporter is someone who loves the club. The fan will come to watch the team and be entertained but a supporter will come to do exactly what the name says, support the team. A fan will be loud and proud in the good times but a supporter will be loud and proud in the bad times. A fan will sing when we are winning but a supporter will sing when we are losing despite how badly. Before this turns into a poem, I will stress, that this is only my opinion. Until this morning, I thought a fan and a supporter is the same thing but after listening to other people on twitter, I think there is a slight difference. Call me arrogant but I think I am a supporter. I have always been keen to listen to people older then myself about how life at Arsenal used to be and always want to learn more about the history of the club. I do feel that younger fans, the same age as me, have been spoiled because they are so used to having success. Being 22 years old, I gained an interest in football and Arsenal in 1995 and from 1996, I have been a keen follower of the club, so Mr Wenger is practically all I know, however, I have learned about the history of the club. I was very used to success because of the double in 1998, the cup finals in 1999 and 2001, and the double in 2002 and off course the unbeaten season in 2004 which was followed by the FA Cup the year after. Even the Champions League final run was very special. Even though I have been spoiled, I have never taken it for granted and that’s something others must not do. Before the title win in 1989, there was limited success. The last time the league was won (before 89) was in 1971 where Arsenal did the double. So the club went from 1971 to 1989 without a league title, Arsenal did win the FA Cup in 1979 and the League Cup which was known as the Littlewoods Cup in 1987 where the record of Liverpool always winning when Rush scored first was broken but that was it when it came to silverware in between 1971 and 1989. That puts this drought from 2005 to 2010 in perspective. The club is well run, the finances are in order and we do not rely on Russians, Sheikhs or Americans for investment. We built a brand new training ground and a stadium rather then getting one for next to nothing like certain teams have or will (you can have your commonwealth games and Olympic Games stadium’s because we built our own!) So sometimes you have to deal with the bad times (even though some would argue, being in the top four every season and playing in the Champions league isn’t all bad) to get the good times. So if success is the reason why there are more ‘fans’ then ‘supporters’ or why the crowd are so quiet then some sort of perspective is needed. As a supporter, I will be ‘loud and proud’ every time I watch the Arsenal, never mind the score line. I would love the Emirates to be rocking like it was for that Champions League game against Manchester United (for a few minutes at least) or rocking like it was when Thierry Henry scored the winner in the 93rd minute against the same opponents Manchester United. I know Highbury was known as a library but that season when we got to the Champions League final (last season at Highbury) was special. The atmosphere before, during and after the game against Madrid, Juve and Villarreal was unreal. The best atmosphere I have seen was in 2004 when we beat Liverpool after Thierry scored his second goal when he ran through the Liverpool defence. We had just lost to Manchester United and Chelsea in the FA Cup and Champions League respectively so there was a big sense of relief about the victory because it set us up for the league title and off course we ended up going through the whole season unbeaten, an achievement which has never got the praise it deserved. The longer time goes on and the longer this record is never matched, people will see how special the unbeaten season really was. I have gone on a bit in this post as the subject was suppose to be about the atmosphere at the Emirates but it has ended up being a bit of a rant. There is no offence meant to anyone in the blog because we all want the same thing. We want the team to win and therefore I would like to see the atmosphere improved at the Emirates because I feel it can help. Having a good atmosphere can only be a positive for the team. The Kop at Liverpool is a great example, I am convinced that the Kop has won Liverpool games, the energy they provide during games has urged their players on and they truly are like a 12th man. Even though Pompey is in bags of trouble, I was most impressed when visiting Fratton Park because of the atmosphere; they really did get behind their team. We saw it last week at Shakhtar too how intimidating an atmosphere can be. Let’s try and get behind the team and get back on track. I will not be at Wolves but will be present at Everton but let’s support the team like usual and especially on our travels, because our away support is brilliant. Let’s help the team bounce back and let’s try and add some silverware to the honours list! We all have aspects of our life that we like to deal with privately and none of us would want to talk about our private life in public. Mr Wenger is a man of class; he will never speak publically about his private life and that is how it should be. What happens in one’s private life should not be off any concern of anyone else. As supporters of our club and the Gaffer, we can only keep supporting the club and players and off course the manager. I doubt we will ever know more about these allegations because Mr Wenger will not comment, even if it’s just to deny it. That’s the way it should be done, no one wants their private life slapped all over the newspapers. We live in a world where celebrities can get injunctions which can stop the press from printing stories and we know how certain players love to get them! In this case, there seems to be no injunction or no real effort made to block the story, so make your own mind up. Despite everything in the Sun, I wouldn’t want to judge before knowing the full truth and as we may never know, I will concentrate on supporting the team on the pitch. Mr Wenger has been here over a decade and is idolised by most Arsenal fans and certainly by me. Let’s leave his private life to him now. The only fear I have is if the pressure get’s too much for him or for his family, it could tempt him to walk away. Having practically followed everything Mr Wenger has done and said in his time here, he is always quick to take the spot light away from his family. Being present in press conferences with him and having met him a few times, he does seem a family man and keep’s his family out of his professional life. If questions are asked of his family and the pressure on them increases, then could this tempt him to perhaps move on? I do not know the answer but this is a small fear I have and I am sure many of you have too. Whatever happens happens, but Mr Wenger has my backing and support because he is simply one of the best managers to have ever managed in world football. Let’s get behind the team because end of the day, three points against Newcastle is important and we must not let any distractions affect the club. For me, that is the end of the matter and will try not to comment on it. Anyone going on Sunday should get behind the team and manager as normal, I certainly will. Say what you want about our great manager because we won’t believe it. Mr Wenger was in his usual good mood in today’s press conference and that did not look like a man who was guilty of any wrong doing. IF something like this was actually true, would he be in such a good mood and that approachable in a press conference? I certainly would not. We all know and agree that some stories that are written are not always true. I read a story on twitter from a female saying she had an affair with a Premiership and England footballer but the story was a non-starter and only a few media outlets ran with the story. I have the faith and belief in my manager and think the story will just blow over as it sound’s like a complete non starter. AND on Sunday, i most certainly will, but i would hope the WHOLE of the Emirates get's behind our man. My latest post is once again about the Saturday just gone and in particular a special moment after the game (West Ham). The game in general was a nervy one! When ever you enter the last five or so minutes with the score line still level, the nerves do get the better of you. 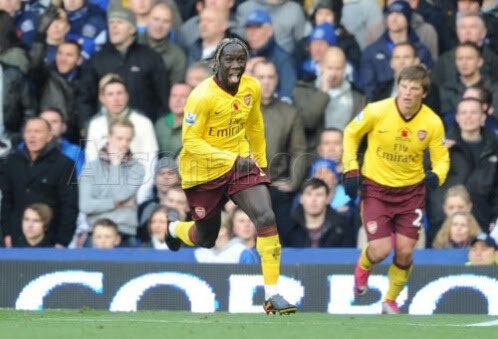 The fact that Arsenal got the winner shows the desire and hunger that our manager often talks about. After winning at Eastlands the other week, all the hard work would have been undone, so to take all three points was essential. The Headline about class is for another reason however, and after the game I saw even more class from our manager yet again. I have always been a great follower and believer in Mr Wenger and ever since 1996 I have been hooked. The way he run’s this football club is second to none and without him I hate to think where the club would be now. 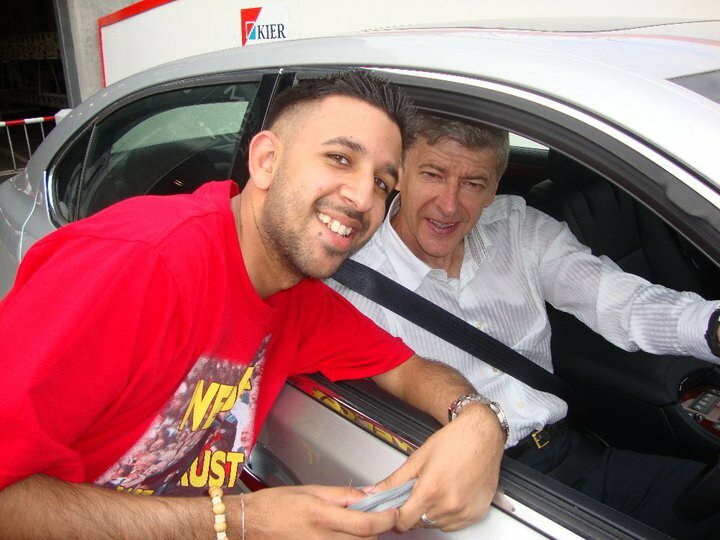 When exiting the stadium I saw Mr Wenger’s car and he had stopped for a few fans that had spotted him. He was signing autographs for these fans and I walked past. He started to move off but as his window was still open I congratulated him on the win. I have met him a few times recently as a fan and also as a professional at his pre match press conferences. 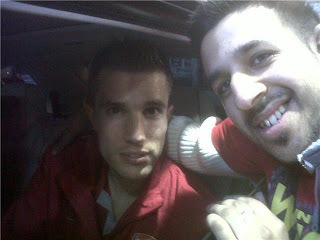 He looked at my t-shirt (In Wenger We Trust) a few times as it has his face on it! As he was moving very slowly, the few other fans had turned the other way and I was literally left with my idol on a very quiet road. 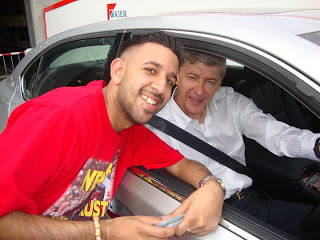 I was walking at the same speed as his car (quite slowly) and I asked Mr Wenger ‘how he was?’ He replied by saying he is ‘fine’ and asked ‘how I am!’ I then said, ‘I noticed you looking at the shirt and if I had a pen I would get you to sign it but I do not, so next time’! His response is what really made my day. He stopped his car, put his handbrake on and said ‘wait’ he then checked his dashboard, his flap thing which blocks the sun above him and also checked the passenger side of the car. I then told him not to worry and he then got a pen out of his jacket and signed my shirt for me. I then asked him how his Birthday was and he said it was good and that he just invited some friends over. I then shook his hand and we went separate ways. As I was in astonishment, the quotes may not be 100% accurate because I was in my own world after this but that was pretty much the most of it. I knew this was a special moment and a moment of such class. Mr Wenger could easily have been polite and smiled but not got his own pen out! I am not sure how many other managers or even players would have done what Mr Wenger did. I ran into John Cross from the Daily Mirror just after and even he was keen to listen to my special moment and was equally in admiration from the class shown by Mr Wenger. He certainly made my day and after such a fantastic week and three clean sheets, this was a perfect way to end a perfect week. Roll on this week! Come on you Arsenal !